Toyota — Was The Real Tsunami Reputation? I saw on a Morning Joe crawl this AM that Toyota reported a nearly 7% sales decline in the U.S. for last year, attributing it to a parts shortages out of Japan and Thailand due to the earthquake and tsunami and flooding. Could it be that the real catastrophe for Toyota was the combination of erosion of their own quality reputation due to the U.S. recalls earlier in the year, together with a resurgence of competitiveness by the U.S. auto industry, which reported double-digit gains for the year? Toyota is still a great auto company, but they are now playing on a much more level field in the U.S. than for many years. It’s not so much that their reputation has been eroded, at least not permanently, just as they will recover from the weather troubles in Asia. But the reputation of the U.S. auto industry for style, engineering and quality has been restored. My personal cars for almost 50 years were foreign built — now we drive two GM vehicles, and we love these cars. I think the size, placement and angle of brake and accelerator pedals, together with the vagaries of shoe or boot size and shape, foot and leg physical issues with drivers, or of driver skill, experience and even mental state could be potential factors in many of these accidents, and together present a set of safety issues that require much more study, engineering and consumer education, to say the least. My own experience is that different cars seems to have different configurations of pedals and space beneath the dash (increased need for standardization? ), which can confuse the feet. Also, tired or numbness in feet or limbs or forms of driver disorientation or distraction might be factors leading to misapplication of brake or accelerator. Having once taught driver education instructors for Allstate Insurance Company, and having also been a public relations executive for Toyota years ago, I don’t recall much in the way of safety studies or driver education practices regarding use of pedals. Some people use one foot for both pedals, some use both, and some switch off. Did anyone ever teach you what kinds of footwear to use when driving, or to check under the dash to be sure your mat is well-placed and fitted or how to keep your legs from getting stiff or numb when driving? If work has been done on these under-dash standardization, safety issues and consumer education, I’ve seen little to none of it, even after these many incidents and the high profile they’ve been given in the press. Isn’t it about time the auto manufacturers, dealers, insurers, safety organizations, consumer groups, schools and government do a lot more to reduce the chances of “driver error” in acceleration and braking, and better communicate to the public about the issues and ideas, before more lives are needlessly lost? 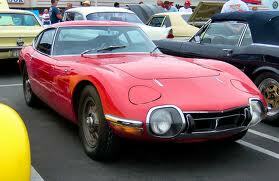 — The Toyota GT2000 of 40 years ago! Read about the role of public relations in building the “Acceleration” of Toyota into favor in the U.S. market of the early 1970s, in this insightful first person account. Seems a flurry of safety recalls of cars known for reliability are not Toyota’s biggest problem. What is? Not building enough auto manufacturing plants in the U.S. and elsewhere outside of Japan. The continuing strength of the yen against the dollar and other currencies is making it more expensive for Toyota to export its cars, and that is costing it both profits at home and sales abroad. The implication: look for Toyota to become even more of a globalized brand, if that is even conceivable. Toyota already has 4 U.S. plants and some 160,000 employees at these and its U.S. dealers. Perhaps that is only a beginning? For all the turmoil over Toyota’s wave of recalls, the world’s largest automaker may face a bigger problem: the surging yen. Toyota is now concluding that at least some of the 2000 reported cases of unintended acceleration by their cars have been proven to be driver error. Here’s the story: http://www.reuters.com/article/idUSTRE66D0FR20100714. As a driver, I had an experience in a rented car outside the Charlotte Airport that made me wonder. It was a foreign car, can’t recall the make, that I’d just rented on arrival. As I left the airport and drove a few blocks, I was alarmed that the car was slowing down when I wanted to go, then would barely move away from a green light. I pulled over into a gas station, and was about to return the hobbled car when I discovered the problem. The gas and brake pedals were closer together than I was used to, and my foot was pressing both at the same time, sometimes rocking toward the brake and sometimes the gas. The inconsistent placement or size of these pedals, compared with what I was used to, was the real problem. Once I realized this, I adjusted and drove off normally. A man in Colorado has survived a near 500-foot plunge off a cliff in his Toyota. A report from the Associated Press reveals police believe the man may have been drinking when he lost control and went over a cliff on a slick road, a crash that could have been fatal. Denver Man Survives Cliff Plunge – Drops 500 Feet! They are now investigating and say the man is in good condition after the harrowing plunge. Police say his seat belt saved his life. Trooper Jonathan Silver says Buckner’s 1990 Toyota hatchback was “pretty mangled,” but thanks to the fact that he was restrained by his seat belt, he was able to survive inside the 20-year old car. Silver says Buckner was driving on slick roads through a mountain pass when the accident happened. According to the Denver Post the Colorado State Patrol said Anthoney L. Buckner seemed to be in “amazingly good condition” after rescuers pulled him up from the crash site earlier this week. Does Toyota really spend $1 Million/Hour on Safety, as TV Ads Claim? By Dexter Ford, on a NYT website: “I asked Bob Zeinstra, the national manager of advertising and strategic planning for Toyota Motor Sales, U.S.A., to clarify the claim. “The $1,000,000 an hour claim represents all Toyota R&D spending globally, much of that allocated to new quality and safety technologies,” he said in an e-mail message.